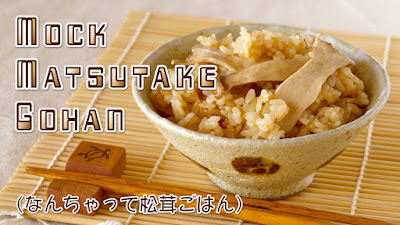 Matsutake Gohan (pine mushroom rice) is a very simple rice dish to enjoy the flavor of Matsutake mushrooms! 2. Clean Konbu with moistened towel. Soak in 600ml water for 30 minutes. 3. Slice Eryngii mushrooms. Rub the Edamame bean pods with 1 tsp. of salt to remove the surface fuzz and wash.
4. Place the rice in a pot, add Kombu Dashi (2) and the seasonings, then mix well. Place the Eryngii mushrooms and Edamame on top of the rice. 6. When it's done, remove Edamame (you can eat them as an appetizer), toss the rice lightly using a rice paddle, then serve. Garnish with chopped Mitsuba (Japanese wild parsley) if you like.